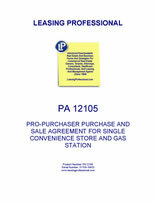 This Purchase And Sale Agreement is for a convenience store and gas station property. The purchase price is to be paid in all cash at the closing. The sale under the agreement is subject to the termination of an existing lease between the Seller and an existing tenant who has been operating the convenience store prior to the negotiation of the agreement. The agreement is pro-purchaser in tone, and contains a number of conditions precedent which must be satisfied before the purchaser is required to close on the sale of the property. The agreement also contains several representations and warranties by the seller concerning the property, and the seller's authority to enter into the agreement to sell the property. This Agreement of Purchase and Sale (“Agreement”) is made as of ________________________ (“Effective Date”) between COMMERCIAL PROPERTY OWNER, INC., a __________________ corporation (“Seller”), and COMMERCIAL PROPERTY PURCHASER, INC., a _________________ corporation (“Purchaser”). 1. PROPERTY. Seller hereby agrees to sell to Purchaser, and Purchaser hereby agrees to purchase from Seller, land located in the City of ________, County of ________, State of ________, as more particularly described in EXHIBIT "A" attached hereto and made a part hereof, together with all tenements, hereditaments and appurtenances thereto, all easements, land division rights, timber, air, mineral, subsurface, riparian and other rights and interests appertaining thereto owned by Seller and all fixtures, tanks, underground storage tanks and related equipment, buildings, signage, structures and other improvements thereon owned by Seller (collectively the "Property"), upon the terms and conditions hereinafter stated in this Purchase and Sale Agreement ("Agreement"). 2. PURCHASE PRICE. The Purchase Price to be paid for the Property shall be __________________ Dollars and 00/100 ($_________) ("Purchase Price"). 3. PAYMENT OF PURCHASE PRICE. The Purchase Price, less the Deposit, and plus or minus the net of the adjustments, prorations and credits contained in Paragraph 4, shall be paid by Purchaser to Seller in certified funds at Closing, as defined in Paragraph 10 of this Agreement. A. All real and personal property taxes and assessments (general or special) which have become a lien on the Property, all charges for improvements or services already made to, or which benefit the Property which have not yet become a lien on the Property; and all assessments (general or special) arising out of or in connection with any assessment district created or confirmed prior to the date of Closing shall be paid in full by Seller at Closing, whether due in installments or otherwise. All current taxes shall be prorated and adjusted as of the date of Closing in accordance with the due date of the municipality or taxing unit in which the Property is located. B. Water, sewer, electricity, gas and other public utility bills for services rendered before Purchaser or its affiliate begin occupying the Property, shall be paid by Seller before Closing. Upon Closing, water, sewer, electricity, gas and other public utility bills for such period of time shall be adjusted and prorated to such date, however, no proration shall be made for public utilities, if in lieu thereof, the respective utility companies are able to bill separately for the amount of utilities consumed through the morning of such date. In such event Seller shall pay the bills rendered for such utilities consumed to the morning of such date upon receipt thereof. All prorations and adjustments shall be made with the day of Closing being charged and credited to the Purchaser. If for a period of forty-five (45) days after the Closing either Seller or Purchaser discovers any inaccuracies or errors in the adjustments, prorations or credits computed at the Closing, Seller and Purchaser shall each take such action and pay such sums as may be necessary so that the said adjustments, prorations and credits shall be in accordance with the terms of this Agreement, and the obligations of either party to pay any such amount shall survive the Closing. 5. DEPOSIT. Within two (2) business days after the Effective Date, Purchaser shall deposit the sum of _____________ Dollars and 00/100 ($_______) (the "Deposit") with ________ Title Company, Inc. (the “Escrow Agent” or “Title Company”) as a good faith deposit hereunder. Said Deposit and any accrued interest earned thereon shall be applied to the Purchase Price at Closing in the event Purchaser consummates the transaction contemplated hereby. Any and all sums deposited hereunder shall be applied to the Purchase Price, paid over to Seller, or refunded to Purchaser as provided herein. All references to "Deposit" shall be deemed to include all accrued interest, if any. 6. TITLE. Seller shall convey to Purchaser at Closing good, marketable and insurable fee simple title to the Property by Warranty Deed, subject to recorded easements, recorded restrictions and/or rights-of-way. 7. EVIDENCE OF TITLE. Seller shall furnish to Purchaser, at Seller's expense, and within twenty-one (21) days from the Effective Date hereof, an A.L.T.A. commitment for an owner's title insurance policy without standard exceptions ("Title Commitment") issued by the Title Company, in an amount equal to the Purchase Price, naming Purchaser as the insured, certified to the date of Closing, undertaking to insure title in the condition required hereunder, with a policy pursuant thereto to be issued as soon as practicable after the Closing. At the Closing the Title Company will "mark up" the Title Commitment in a manner acceptable to Purchaser's counsel. As soon after closing as may be practical, Seller shall deliver to Purchaser an owner's policy ("Title Policy") issued pursuant to such marked up commitment in the amount of the Purchase Price. The cost of Title Commitment and policy shall be paid by Seller, except that Purchaser shall be responsible for the cost of any survey necessary for the Title Company to issue a Title Policy without standard exceptions. The Title Commitment and policy may contain any endorsements requested by Purchaser, at Purchaser's expense. 8. OBJECTIONS TO TITLE. Purchaser shall have until the later of (a) ten (10) business days from and after its receipt of the Title Commitment (and copies of all recorded documents listed in the Title Commitment) or (b) sixty (60) days after the Effective Date, to approve or object to the condition of title disclosed in the Title Commitment or matters of Survey. Purchaser's approval of title and Survey shall be a condition precedent to Purchaser's obligation to close the transaction contemplated by this Agreement, which condition Purchaser reserves the right to waive. If objection to the title or Survey is made, based upon a written opinion of Purchaser, that title or Survey is not in a condition satisfactory to Purchaser, Purchaser, at its option, may either terminate this Agreement and receive back the entire Deposit or give Seller thirty (30) business days from the date it is notified in writing of the particular defects claimed, either (i) to remedy the title or Survey, or (ii) to obtain title insurance as required above, or (iii) to refund the Deposit in full termination of this Agreement, if unable to remedy the title or Survey or obtain title insurance. If the Seller remedies the title or Survey or shall obtain a Title Commitment acceptable to Purchaser within the time specified, and upon waiver or satisfaction of the conditions contained in Paragraph 9, Purchaser agrees to complete the sale and if Seller is unable to remedy the title or Survey or obtain title insurance within the time specified, the Deposit shall be refunded forthwith in full termination of this Agreement. If Purchaser makes no written objections to Seller within the later of: (a) ten (10) business days after receipt of the last of the Title Commitment and copies of all recorded documents listed in the Title Commitment or (b) sixty (60) days after the Effective Date, Purchaser shall be deemed to have accepted the condition of title disclosed in the Title Commitment and matters of Survey and waived its rights to object to the condition of title and to object to the matters of Survey. Notwithstanding the foregoing, Purchaser, at its sole option, may waive any objections to title and Survey, in writing, and in such event, Purchaser and Seller shall proceed to complete this transaction according to the terms of this Agreement, subject to satisfaction or waiver of all of Purchaser's other conditions precedent contained herein. 9. CONDITIONS PRECEDENT TO PURCHASER'S OBLIGATIONS.